This statistic depicts the age distribution in the United States from 2007 to 2017. 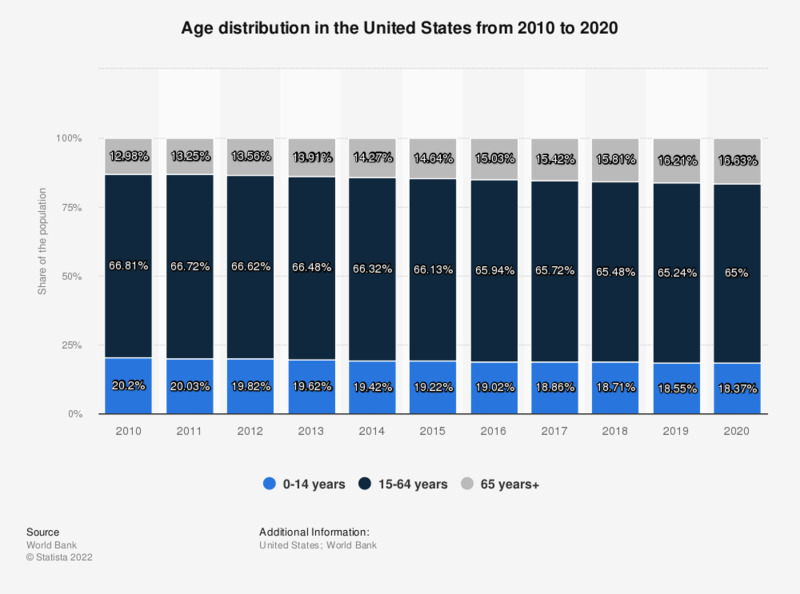 In 2017, about 18.91 percent of the U.S. population fell into the 0-14 year category, 65.67 percent into the 15-64 age group and 15.41 percent of the population were over 65 years of age. The United States of America is one of the most populated countries in the world, trailing just behind China and India. A total population count of around 320 million inhabitants and a more-or-less steady population growth over the past decade indicate that the country has steadily improved its living conditions and standards for the population. Leading healthier lifestyles and improved living conditions have resulted in a steady increase of the life expectancy at birth in the United States. Life expectancies of men and women at birth in the United States were at a record high in 2012. Furthermore, a constant fertility rate in recent years and a decrease in the death rate and infant mortality, all due to the improved standard of living and health care conditions, have helped not only the American population to increase but as a result, the share of the population younger than 15 and older than 65 years has also increased in recent years, as can be seen above.